That uses rtos, this uses arduino, I found edzelf’s project more enjoyable to hack around with also streamed higher bitrate samples better for me. The max I could get streaming on ka-radio was 24kbps not sure why. I play 320Kbps without problem. Wonder if there was bug fixes since I was testing it out. I basically abandoned ship after getting no response here maybe I should have done another issue for it https://github.com/karawin/Ka-Radio/issues/24 maybe you can help? 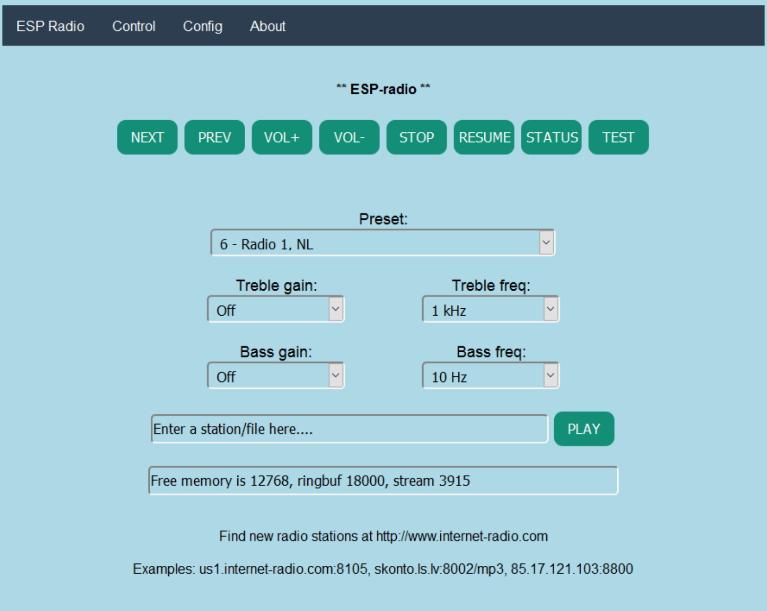 I was already on to esp-radio by then and was able to hack in IHeartRadio streams into it which was so my partner could listen to their hometown radio station they loved which they couldn’t get where we are now. So your external ram is detected. I made 4 karadio without problem. Any way to figure out what is wrong with any streams above 24kbps. Using an Adafruit Huzzah (ESP8266). 50Mbps connection, any way to do a speed test on the module? I’ll have to recompile the latest code and see if it’s still the case. Do you run the processor @80MHz or 160MHz? Sprite_tm made something similar that uses the ESP8266 itself for decoding, but it has no web interface (nearly all the chip’s RAM is used for the MP3 decoder, and it uses an external RAM chip for buffering). Edzelf’s uses no ext ram just an internal ring buffer. Awesome!!! Absolutely a good example of human-machine-interface efficiency, thanks for the link. I helped add IHeartRadio streams to it, that interface may be a bit memory hungry for the esp8266, very neat idea. You dont really need the VS1053. if you settle for mono audio you get a 44.1KHz 16bit PDM-DAC straight on the i2s output. Tried to get both esp-radio & ka-radio projects to add mono dac output like esp8266encoder was doing, both shot me down with it’s not worth the extra effort and doesn’t sound very good. I’d say you did something wrong if my PDM didnt work. Its the same algorithm used by PDM microphones, however at 3MHz bitrate instead of 1.4MHz. I like the MQTT feature as it allows you to have audio announcements of events in a smart house, regular time and weather reports plus door bell, email notification. I wonder if you could add RFID so that you could log your presence as you entered a room and have your notifications and music follow you around. Also liked MQTT as why I was attracted to this code base, hacked around with the code to make it work with OpenHAB with MQTT control interface was lot’s of fun to get working. Over killed the mqtt memory constraints though with too much information. I also wanted to send audio prompts to it for notifications from openhab like “hello family, it’s after 10PM your garage door is still open would you like me to close it?” Etc… I did a sample test with online tts engines found out there is a max url size you can send it ~100 chars, then found out you can use POST instead and that allows for longer sentences. So that is a fun possibility to feed it any text you want like that or similar. You could do some openhab scripting to get your rfid working like that, “sounds” pretty straight forward, interesting idea. My mouse wheel is dead because of you. Kinda meh that he still uses a hardware mp3 decoder. The ESP8266 already was pretty capable of decoding mp3s at 80MHz (the mp3 decoder was limited to mono because of memory usage); the ESP32 can do stereo MP3s at any rate while still idling its CPUs most of the time. Would it be plausible to do AAC in the same way, as most radio stations stream with this format now. MP3 seems to be going the way of the Dodo bird and that encoder ic basically supports almost every format with upgrade possibilities to more formats. It will also encode audio as well to those formats. Would be cool to see someone do a massive roundup of decoding every possible audio format on the fly for the ESP. Probably legal concerns but would be interesting. VS1053 is a versatile “MP3 decoder chip” belonging to VLSI Solution’s extensive slave audio processor family. In addition to being able to decode all the most common audio formats – including the advanced features of newer AAC files – functionality of this IC can be greatly expanded just by loading a bit of extra software to its RAM memory. In addition to being able to decode all major audio formats, VS1053 is capable of recording in three different audio formats, from lossless 16-bit PCM to highly compressed, yet high-quality Ogg Vorbis files. For the best headphone listening experience the VS1053 includes EarSpeaker spatial processing which accurately simulates how a room with stereo loudspeakers would sound. This option can naturally be turned off when required. All in all, VS1053 is an easy-to-use, powerful workhorse for audio playback and recording applications. The new ESP32 already has bluetooth, so i guess it can be used as bluetooth speaker. Idealy BT speaker that can receive audio from multiple BT sources and mix them together. While simultaneously working as pulseaudio sink. VS1053 is a versatile “MP3 decomputer coder chip” belonging to VLSI solution’s extensive slave audio CPU category. Fine project. Flashed my ESP8266f, used the AP to connect to my WiFi. Music plays, In serial console I can see some info, but I am not able to send commands via serial to the ESP. Also I am not able to connect to the WebInterface. maybe i have overseen a little bit ?! ?